Banners for shop windows, retail outlets and professional services. Ideal for coffee shops, hairdressers, bars and restaurants. Text printed on frosted window film allows plenty of natural light. Designs for hair salons, hairdressers and barbers. 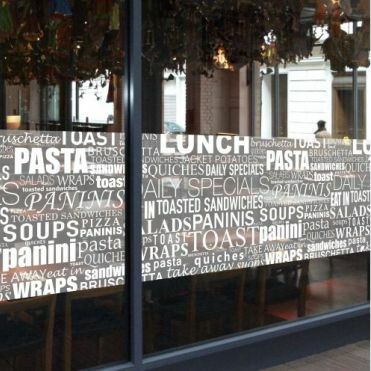 Window film banner and graphics for coffee shops and sandwich bars. Make your shop stand out on the high street with our easy to apply frosted effect window banners. We have designed a range of ready-made graphics for shop windows and glass partitions, which can be ordered in a selection of height and width to suit your requirements. Each design comes as a repeat pattern and as such can be ordered as a run across several panes. As the film is applied internally, to be seen (and read in the case of text-based graphics) externally, it will be supplied printed in reverse. Our films are easy to apply, and we have some videos to illustrate the installation process. Should you have your own designs or artwork, we also offer a bespoke printing service. Please send us an email with your requirements.